Blessings, Miracles, &Thoughts in Between: Two Months! I can't believe my sweet little boy is two months old today! What an amazing two months it has been! 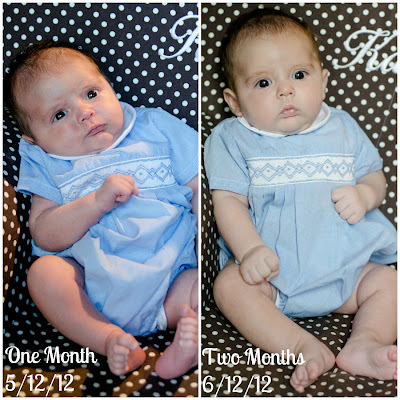 I totally slacked on his one month post so I thought I'd share his "official" one month picture and then compare it to his two month picture. I feel like he has changed so much over this past month! He doesn't look like a little newborn anymore! So what's been going on with out sweet Will? *He is sleeping SO well! This is such a change from his big sister who pretty much hates to sleep. I am up more with Kate than I am Will which is just crazy to me! He's been a good sleeper since birth and to be honest I don't remember exactly when he started sleeping through the night. Maybe it was around 5 or 6 weeks? Either way, he sleeps from 7:30pm to about 6 or 7am, takes a bottle, and goes back down until 9am! It's pretty amazing! 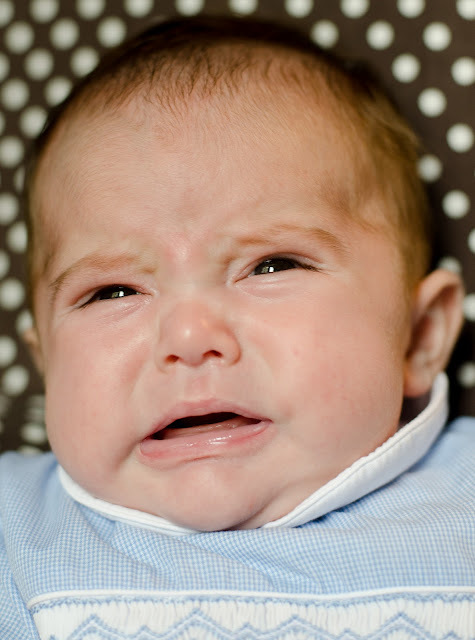 *He hardly ever cries - such a change from having a colicky baby the first time around! But, when he does cry? He is still the cutest thing ever! *Food is his friend! Will can eat! He currently packs away 6 ounces every 2.5-3 hours during the day. Sometimes he even wants to eat every 2 hours! Again, this is such a change from Kate who never ate much and threw up non-stop! His weight reflects his love of eating! *Speaking of food - Will's love of food is evident in his clothes! He is wearing anywhere from 3m, 3-6m, to 6m clothes depending on the brand! 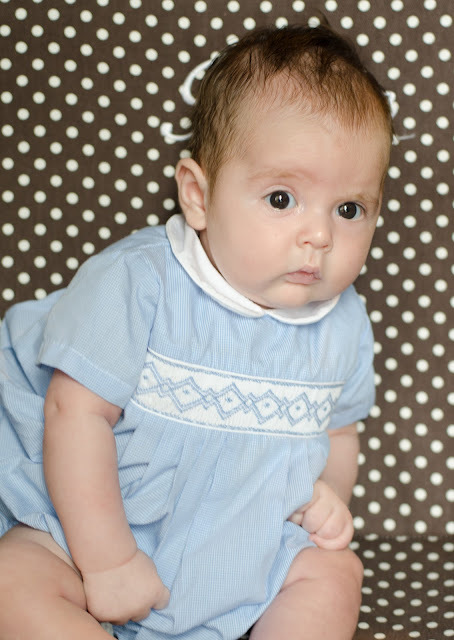 I'm thankful that most of his smocked things seem to run bigger so he can still wear them! I need to get a few more wears out of all of the matching sets I purchased! I'm starting to think Kate and Will will be in the same size before too long seeing as Kate is still wearing 12-18 and 18m clothes! *He is holding his head up so well and thinks he is such a big boy! *Naps are still pretty hit or miss. If I hold him, he will get one good nap in while Kate takes her nap. I love the cuddles so much but, I'm thinking I need to start getting him to nap in his crib so I can actually get things done around the house! As of now I am totally reliant on our house keeper to ensure my house is not a disaster! *Will is starting to smile socially but it is still very inconsistent. However, when he does? Melt my heart! His dimples are just the sweetest thing ever and I love seeing his precious smile! I just love this sweet little boy so much and cannot imagine our lives without him! he definitely completes our family and the Lord knew what He was doing when He blessed us with Will! I can't get over the cute difference b/t month 1 and 2! he looks so grown and handsome! Also--the sleep thing? I can't even believe it. I mean, I'm in awe. I need to pray this baby follows in Will's path and not her sisters because Eme was THE WORST for 11 months. 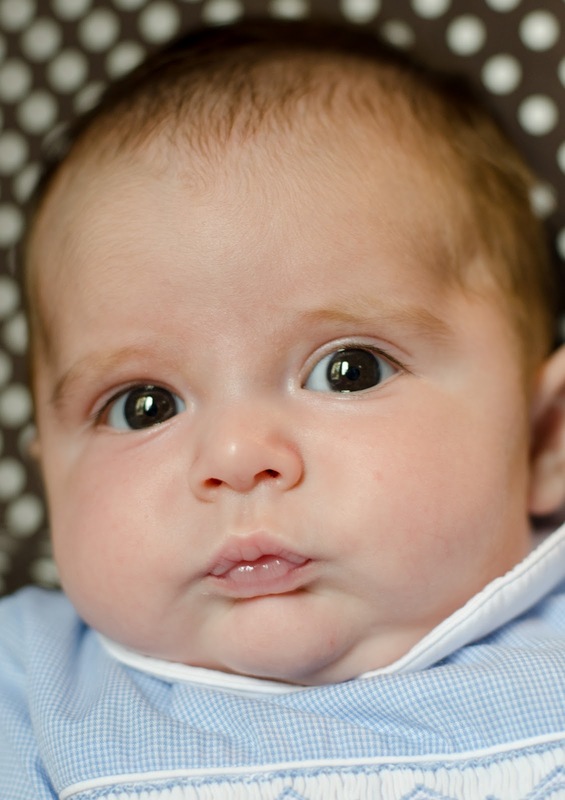 I cannot believe that he is already 2 months old! I feel like you JUST had him! He is so adorable and I am so glad you got to experience a "good" baby who loves to sleep and eat!! There is no way that it has already been two months! He is absolutely adorable!!! I can't believe he is already 2 months old!! Such a huge difference between his 1 and 2 month pictures. He is adorable and so glad he is sleeping and eating well for you! Will is just the cutest little thing ever. I can't get over that cry face!!! So adorable. Makes me KIND of want another one. LOL! I had to check for a second to make sure that I really was on your blog because holy wow, how is he two months already?!? He is getting so big! And those eyes are amazing. What a cutie! Isn't it crazy what having a second baby can illustrate about the parenting "experience"? It is so different and you realize how much of people's perceptions of what is easy or hard come from the termperment of their baby, not the way they parent them :). Handsome bebe. How is he already 2 months old?! He's just too cute and what a difference a month makes - wow! 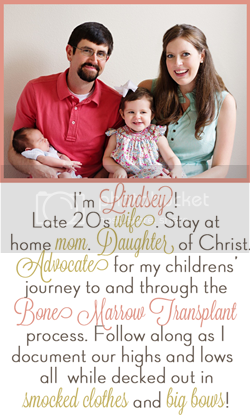 Hi Lindsey! He is just too cute! We stopped by to tell you two that we nominated you for an award! Check it out at http://www.thechirpingmoms.com It's fun!